This is a haiku of symbols–one in each line. 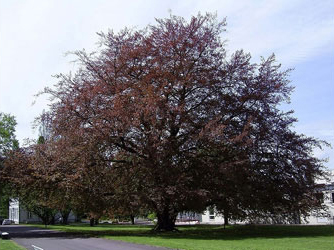 The main image comes from a large beech tree, which looks like the one in the attached photo. We parked under this tree, while visiting my parents. As with the previous haiku (#5), I wanted a noticeable nearby natural image. This tree rises proudly in front of the “Manor House” near my parents’ new home. It is about fifty feet tall and almost as wide. It has deep purple leaves and a large gray trunk. If my wife and I joined hands, trying to reach around the trunk with the free hand, we would not touch. During the hot, humid summer months, the big tree gives welcome shade all day. This is also a harsher, more pragmatic and realistic haiku than the others so far. Starting with the word “old,” it describes disfigurement and struggle. Granted these initial descriptions end in “golden leaves,” but the poem’s rough start is undeniable. Once I saw the strength of this old tree, amidst its gnarls and winters, I thought of a marriage’s lasting sixty years. We know this takes persistence from both partners. The last line of the poem, however, paints this commitment in gold. In other words, loving and lasting marriages weather storms that bend branches, and those branches keep growing. Line two echoes this growth with the word “living.” The use of “winters” as a symbol of struggle reveals the writer’s life in areas where plants, animals and humans fight against the colder, darker days. This symbol also, incidentally, reflects my reading of a book called Black Elk Speaks, in which the Lakota medicine man who narrates the story asks, “What is one man to make much of his winters, even if they bend him like a heavy snow.” At certain times of year, before winter, the leaves turn gold. (Here, I used artistic license by changing this tree’s deep purple leaves to gold, for symbolic reasons.) In this last line of the poem, I wanted to remind my parents, myself and others of this large tree’s beautiful presence. Yes, a close look reveals some crooked branches that have grown through strong winds and reached for sun. On occasion, though, as during this anniversary weekend, we step back and reflect on its graceful grandeur.